In the days it took for my donut pan to arrive – because seriously, who has the money for Amazon Prime? – I spent most of my time daydreaming about what I could make; matcha donuts, coconut donuts… mini bagels! The list was endless, but something was telling me to throw some gin into the donut pan, and I am never one to resist the call of Bombay Sapphire. 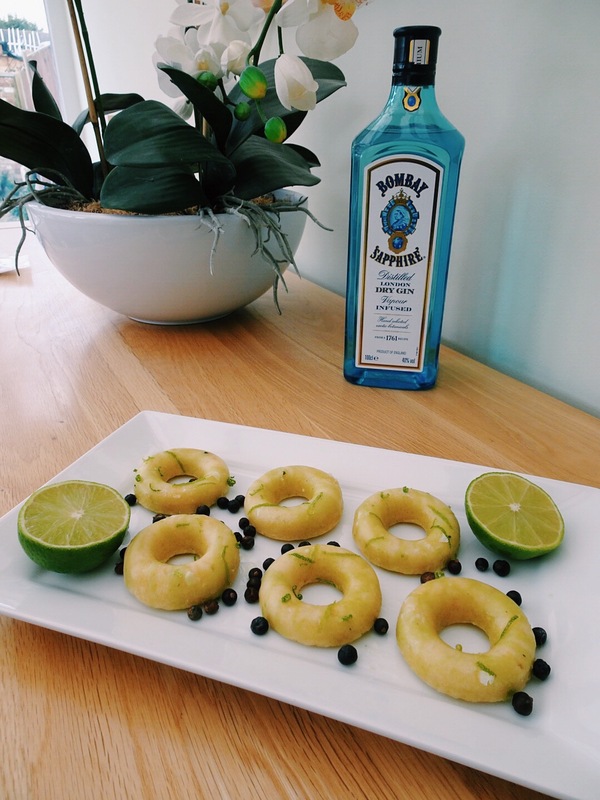 And so, the gin and lime donuts were born. To add the floral aroma of gin to my donuts, I infused the milk in the batter with some crushed juniper berries. They smell just like Bombay Sapphire so they complemented the flavour of the gin in the glaze perfectly. Surprise, surprise, they were yet another impulse Amazon purchase, but aside from using them for this recipe, they also look nice floating around in a gin and tonic for when you want fancy looking drinks with zero effort required. I adapted my recipe from this Lakeland recipe, but having made a slightly unsuccessful first batch, I realised that the timing and temperature was for a metal pan, and mine is silicone. I adapted the recipe accordingly and voila, the donuts came out perfectly! If you’re using a metal donut pan, be sure to stick to the original temperature and timing, or you may end up with cremated donut remains. No amount of gin can save that. The final and most important part of this recipe has to be the glaze; the crowning glory of every donut. This is a simple but tasty combination of gin, lime juice and icing sugar all topped off with a final sprinkling of lime zest. I think Mary Berry would approve. 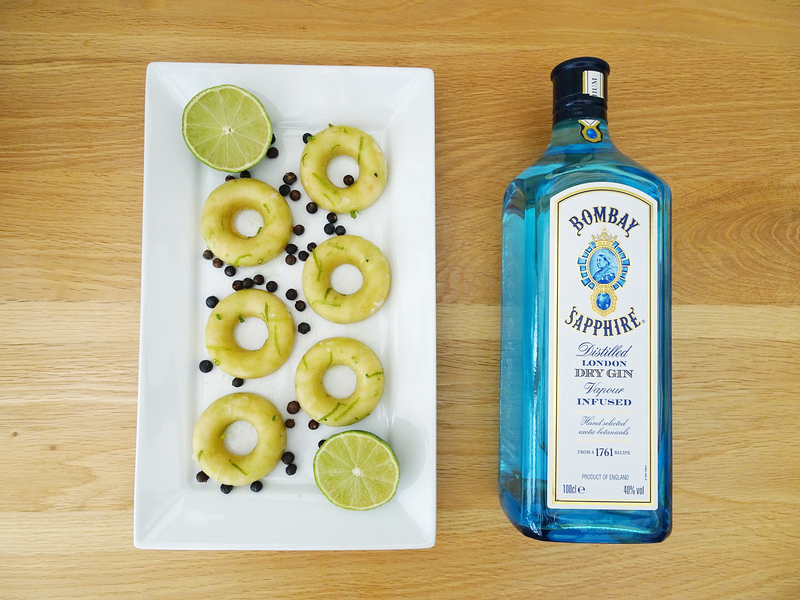 A grown-up twist on the mini donut, spiked with gin and lime for a sweet treat with a kick. Makes 10-12 mini donuts. Preheat oven to 200c/180c fan and brush donut pan with melted butter. Crush the juniper berries between your fingers and add to a pan with the soy milk over a low heat. Gently heat the milk and juniper berries together for 10 minutes to infuse, but do not let the milk boil at any point. Strain the milk and measure, ensuring there is no more than 60ml of juniper infused milk. This should have evaporated during the gentle heating but if not, discard any extra, then leave to cool. Take a large bowl and sift the flour, baking powder and salt into it, then add the sugar and stir to combine. Add the egg, melted vegan butter, gin and lime zest to the cooled milk and beat until well combined. Use a teaspoon to carefully fill the donut cups to around 3/4 of the way full. Be sure not to cover the centre or your donut will not have a hole all the way through. Place in the oven and bake for 10 minutes until firm but springy to the touch. Leave to cool slightly before removing them from the tray. To remove them simply flip the tray upside down and gently pop them out of the silicone. Leave to cool completely before glazing them. To make the glaze, combine the icing sugar, gin and lime juice and mix well until smooth and glossy, then dip each donut into the glaze and sprinkle with lime zest. They're delicious eaten straight away, but even better once the glaze has been refrigerated and hardened for an hour or two. If using a silicone donut pan, use the timing/temperature provided here, but if using a metal donut pan, be sure to refer to the original recipe to avoid overcooking.